Labelmaster’s Obexion lithium battery packaging wins 2019 Industrial Pack Award for innovation, mitigating the risk of shipping lithium batteries. March 20, 2019 (Chicago, IL) – Labelmaster, the leading provider of products, services and technology for the safe and compliant transport of dangerous goods (DG) and hazardous materials (hazmat), today announced that its Obexion packaging has received the 2019 “Industrial Packaging Award” for the “Excellence in Transit Packaging” category. Obexion was selected for enabling the safe and compliant transport of lithium batteries and will be recognized during Industrial Pack 2019 in Atlanta on March 27, 2019. Labelmaster’s Obexion packaging is a complete line of protective packaging solutions engineered specifically for shipping and storing lithium batteries and devices that contain them. 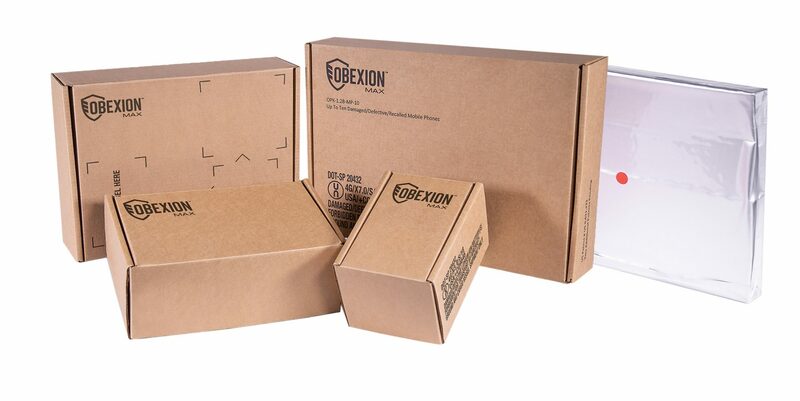 Unlike other lithium battery packaging solutions, Obexion is a lightweight, fiberboard box that mitigates the risk of fires by containing pressure, fire, gasses and projectiles, yet requires no use of gel packs, heavy liners, pellets or fillers. Using an innovative fire-retardant material within the corrugate fibers, a proprietary heat shield pulls the heat and flammable gases away from a thermal event. Unlike other lithium battery packaging solutions that use heavy wooden crates, metal or plastic boxes, Obexion is a lightweight box that arrives pre-assembled with easy-to-understand directions – reducing shipping costs and simplifying shipping operations. To learn more about Labelmaster’s Obexion packaging, visit: https://www.labelmaster.com/obexion. For more than five decades, Labelmaster has been the go-to source for companies – big and small – to navigate and comply with the complex, ever-changing regulations that govern the transport of dangerous goods and hazardous materials. From hazmat labels and UN-certified packaging, hazmat placards and regulatory publications, to advanced technology and regulatory training, Labelmaster’s comprehensive offering of industry-leading software, products, and services helps customers remain compliant with all dangerous goods regulations, mitigate risk and maintain smooth, safe operations. Labelmaster’s dedication to supporting its customers’ operational and compliance needs is enhanced through its unmatched industry expertise and consulting services, which serve as a valuable resource for customers to answer difficult and commonplace regulatory questions. Whether you’re shipping hazardous materials by land, air, or sea, Labelmaster is your partner in keeping your business ahead of regulations and compliant every step of the way. To learn more, visit www.labelmaster.com.